WBAI is a non-commercial, listener-supported radio station with an emphasis on progressive politics. Broadcasting at 99.5 FM in New York City (from a transmitter atop the Empire State Building) the station first went on the air in 1941, and by the 1970’s was an influential force in leftist politics and culture on the airwaves. The station’s adventurous programming included a round-the-clock live reading of Tolstoy’s epic novel War And Peace, which took over four days and two-hundred readers to complete; and an uncensored broadcast of George Carlin's iconic Seven Dirty Words routine, at two in the afternoon, no less. The latter led to a Supreme Court ruling which to this day dictates the government’s right to regulate the airwaves against indecency. The station has presented the work of many contemporary artists, particularly those whose work crosses over into poetry, performance, music, dance and theatre, including Vito Acconci, John Cage, John Giorno, Philip Glass, Joan Jonas, Meredith Monk, Yvonne Rainer, Willoughby Sharp, Robert Wilson, and numerous others. The Guerrilla Art Action Group was formed in October 1969 by artists Jon Hendricks and Jean Toche. Hendricks - now the curator of Yoko Ono Exhibitions and one of the leading authorities on Fluxus - had then been serving as the director of the Judson Gallery at the Judson Memorial Church in New York City, initially as a requirement for his Conscientious Objector status, to avoid conscription to fight in the Vietnam War. During this time he curated numerous now-legendary Destruction Art events at the liberal church, including a garden performance where Hermann Nitsch gutted a lamb, Lil Picard burned feathers and images of war, and Charlotte Moorman - performing Nam June Paik’s One for Violin - smashed the instrument over the head of a spectator protesting that the violin should be given to a music student instead of being destroyed. When Hendricks co-curated the Destruction in Art Symposium USA 68, he invited Jean Toche to participate. Toche had attended the original DIAS in London, two years prior (destroying typewriters with a hammer, alongside Al Hansen). Born in Bruges, Belgium in 1932, Toche relocated to the USA in his early thirties, where he became active in the radical political art scene, staging happenings and publishing manifestos. The FBI described him as a "professional troublemaker, foreign agitator, peacenik, dirty commie, flag burner, big tall burly bearded hairy man". Toche now lives in Staten Island and remains active with political art mailings and publications such as I Piss On The Arts and Waiter! There’s a Terrorist in My Soup. For a couple of years I was on his mailing list and received almost daily denouncements of George Bush and the Iraq War, in the form of hand-made postcards. Hendricks and Toche were part of the Art Workers’ Coalition, a loose association of artists, writers, and cultural workers founded in 1969 around shared commitments to social action and the reform of art institutions. Other members included Carl Andre, Robert Barry, Gloria Greenberg Bressler, Selma Brody, Mark Di Suvero, Hollis Frampton, Dan Graham, Hans Haacke, Joseph Kosuth, Naomi Levine, Sol LeWitt, Lucy Lippard, Lee Lozano, Barnett Newman, Lil Picard, Faith Ringgold, Seth Siegelaub, and Michael Snow. Not unexpectedly, the large group (there were reportedly over 300 members at one point) became increasingly fractured. Hans Haacke noted "What one wants, the other objects to strenuously; e.g. one wants to destroy museums, the other wants to reform them or to use the museums as they are for his own artistic ends, and the third simply wants a piece of the pie." endricks and Toche formed the Guerrilla Art Action Group, one of many AWC splinter groups, which also included WASABAL (Women Art Students and Artists for Black Artists’ Liberation), the Black & Puerto Rican Emergency Cultural Coalition, the Art Strike, the Emergency Cultural Government, and WAR (Women Artists in Revolution). The GAAG began with the intention of staging actions that could reach a wider public than the insular audience for political performance art. ''If I could have stopped the war with a painting, I would have done that; but I'm not a good painter,'' Hendricks told the New York times in 1997. Whereas the Artists Workers Coalition were primarily interested in artists' rights, the Guerrilla Art Action Group were interested in artists' responsibilities. And the responsibilities of art institutions. The radio broadcast was made just a few months into the activities of the GAAG, but already the group had spilled blood in the lobby of the MoMA to demand the Rockefellers resign from the board of the museum, due to their involvement in weapons manufacturing for the Vietnam War. They had also demanded that the MoMA sell a million dollars worth of art from their collection and distribute the funds to the poor, and close their doors for the remainder of the war in Vietnam. They asked the director, John Hightower, to host a press conference and announce "I am guilty, I am guilty, I am guilty" while they poured beef blood over his head. Unsurprisingly, none of these things happened. Billed as an Action-Interview, the audio on the LP consists entirely of members of the GAAG (Toche and Hendricks are joined by member Poppy Johnson, and Laurin Raiken, from the Art Workers Coalition and the New York Free Theatre) making statements and posing questions. The topics - virtually all of which still resonate with conversations still taking place today - include the problematic relationship between art and business, art and the military, art and class, art and community, and art and race. Some of these statements are broad enough to be considered directed at the general public ("As long as we have business values, we will have racism and poverty") whereas others are clearly designed to have artists rethink their own complicity in the moral failings of institutions ("What is more important to you? To exhibit in a museum, or to fight for the human rights of the oppressed? ", "Is it more important to you to sell your painting, or help human beings?"). "Today artists are egomaniacs" reminds one of Hendricks' connection to French artist Ben Vautier, who made the artists' ego a subject of long-term investigation. "Culture should deal with process, not objects" reaffirms his connection to the conceptual art he was exhibiting at the Judson, and to his longstanding professional relationship with Yoko Ono, one of the progenitors of conceptual art. "How long will you accept being the repressed lackey of society’s manipulations?" "Are you guilty of being a repressor?" "Do you think an artist is more important than another human being?" "Are you on some kind of ego trip?" "Are you one of those pimps who makes his wife work so that he can paint all day long?" "Should western culture have a monopoly on culture?" "Shouldn’t people have control over their own culture, whatever race they belong to?" "Do you work for a racist institution?" "Do you think that art should serve the function of cleansing the image of murderers?" "Are you guilty of supporting racist and repressive cultural institutions?" "How long will you accept being the oppressed lackey of society’s manipulators?" "Are not most artists concerned with being part of the cultural mafia at any cost?" "Are you ready to fight against the subversion of culture by business?" "Have you decided that the present cultural and cultural institutions are oppressive?" "Do you enjoy being the creative toy of an elite?" "Are you guilty of being such a toy?" "If you are involved, shouldn’t you renounce it?" The MoMA had initially agreed to fund and circulate the poster, but was vetoed by the president of the Board of Trustees, William S. Paley, who reportedly "hit the ceiling" when he saw the poster proofs. Paley was the chief executive office of the CBS radio and television networks at the time and he and fellow board member Nelson Rockefeller were both "firm supporters" of the war and had backed the Nixon administration. MoMA withdrew their funding and issued a press release which stated that the project was outside the "function" of the museum, which could not take a position on any matter not directly related to a specific function of the institution. This was the institutional environment that the GAAG were working in, silent on the subject of war, race, class and gender, while taking money from corporations that profited from the status quo of these very issues. 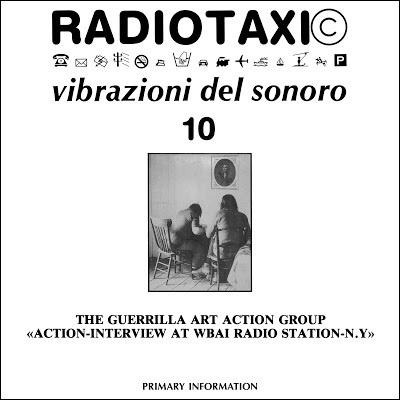 The recording was originally released by Edizioni Lotta Poetica and Studio Morra as part of their Radio Taxi series, which also featured audio works by Henri Chopin, Jackson Mac Low, Philip Corner, Bernard Heidsieck, Hermann Nitsch, and others. Primary Information present the gatefold sleeve in near facsimile to the original, with the complete text of the performance and a cover photograph by Hendricks' wife Joanne. The work is an effective example of agit-radio, with the phrasing of the questions sometimes feeling like an interrogation. The last ten minutes or so consists entirely of a man (Hendricks?) shouting out the word "help" over and over again. Listening the other night, I felt compelled to turn the volume down to avoid alarming my neighbours. Hearing it broadcast live in 1970 would have been considerably more discomforting. The disk is currently on sale for only $16 US at Primary Information, here. *Other Primary Information audio re-issues include How to Make a Happening by Allan Kaprow, the UJ3RK5 Live From The Commodore Ballroom, and Canciones de Cadaques by Dieter Roth and Richard Hamilton.